English Title: LOL: Laughing Out Loud. Release Date: 10.02.2012 (India), 04.05.2012 (USA). Genres: Drama / Comedy / Melodrama / Remake. Starring: Miley Cyrus, Demi Moore, Ashley Hinshaw, Douglas Booth. The American remake of the French movie LOL was handled by the same Director. After getting access to fresh Hollywood money, Lisa Azuelos find a way to use them. The new motion picture LOL, Review of which compares American and French versions, has already started limited screenings in the USA, while it visits Russia roughly two months after that. Luckily, the Press here didn’t have to wait for so long, so we are ready to share our impressions with you. 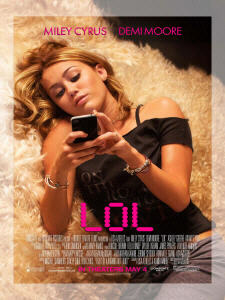 The World Premiere of the new LOL (Laughing Out Loud, 2012) film happened in India last February. Just a month after that was marked by the first anniversary of including the LOL abbreviation into the famous Oxford English Dictionary. If in 1960s people used it to call a Little Old Lady, in 1980s it appeared in the sense we understand this phrase in modern times. LOL is a very common shortening, which can often be read during any virtual chats. In 2006, the American director Joe Swanberg made a film titled LOL (2006), where in an accessible form financed by a small budget and with all amateur actors he investigated the influence of the IT-technologies on social relations between people. In the year 2008 a similar story was made into a French melodrama directed and written by Lisa Azuelos. She has been longing for the La Boum (1980-1982) dilogy stories atmosphere starring Sophie Marceau, where the latter one debuted as one French actress. Lisa Azuelos considers modern teen movies lacking depth and genuine emotions, which were enriching the old classics. Of course, there will be no new La Boum as for now, but both these movies greatly influenced the creative vision of the director. Her LOL (Laughing Out Loud, 2008) film, where Sophie Marceau was already playing one mother managing three kids and trying to understand a teenage daughter, grossed around 33 mln. USD, mostly in Europe. Its budget reached nearly 11 mln. USD, so the movie was a commercial success overall. Just as it happened with a more recent thrillers Nuit Blanche (2011) and Girl with The Dragon Tattoo (2011), basically, it is just a matter of time, till the American producers buy the rights to remake French or Swedish movies for the US-based film market. In this case, a remake of a teen melodrama LOL was greenlit by experienced duo of Michael Shamberg and Stacey Sher, responsible for overseeing the production of both Pulp Fiction (1994) and Erin Brockovich (2000) dramatic story. Distributor Lionsgate after getting more riches out of The Hunger Games (2012) preserved a merely cautious approach for such a remake sticking to the former production budget without increasing it. 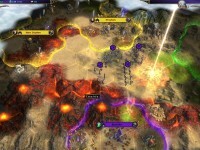 Original LOL began its screening path at the Rome Film Festival in 2008, while the key stops for the updated version were chosen in Europe, Russia and more exotic places like India, South America and South Africa. French actress Christa Theret got a Cesar Film Award nomination in the «Best Young Actress» category in 2010 for her portrayal of Lola in the original film. However, not all out of the Europeans will warmly accept an American remake borrowing nearly everything from its predecessor. At the same time in the U.S. the movie LOL got limited screenings and no serious marketing support. 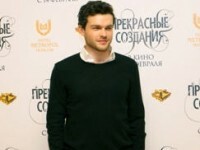 However, this region’s audience could be considered the main target for this remake, because European movies are usually delivered all across the EU and make their way to Russia as well, while it is exceptionally hard to sell a film in North America, where the actors don’t speak English. Anyway, the key bet here would be starring pop singer Miley Cyrus in the leading female role. Her mother Tish Cyrus also entered the Producers’ crew, after the daughter was finally cast. Miley Cyrus has a lot of fans in the U.S., but not only because of her music. She also had a role in Hannah Montana (2006-2011) – famous TV series aired on the Disney channel. Read on further to learn about the story and the characters of LOL.